Have you ever wondered why your phone seems to be running warm or why you are getting all sorts of advertisement pop ups on the screen? Chances are you might have a rogue app installed in your phone. While the risk is high for malicious apps to get into your phone if you install it from non-official sources there’s also a chance that your phone will get infected with harmful apps even if you only download apps from the Google Play Store. 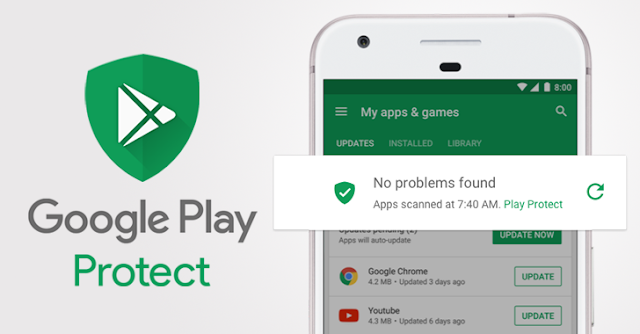 To counter these malicious apps Google has just released a new feature called the Google Play Protect. This is the latest comprehensive security feature of the company which constantly scans your device for any potential threats. Although there is not much difference between this new feature and the Verify Apps feature under the Security setting of the phone this time around though there is a visual UI that is provided for the phone owner that shows various information such as what apps have been scanned and when they have been scanned. According to Google "With more than 50 billion apps scanned every day, our machine learning systems are always on the lookout for new risks, identifying potentially harmful apps and keeping them off your device or removing them. All Google Play apps go through a rigorous security analysis even before they're published on the Play Store—and Play Protect warns you about bad apps that are downloaded from other sources too. Play Protect watches out for any app that might step out of line on your device, keeping you and every other Android user safe." Google Play Protect runs automatically in the background however you can also manually start a scan anytime. Some Android phone models already have this new feature. If your phone still does not have this then you just have to wait for it to be rolled out to your device in the coming weeks.